The iPhone 8 and 8 Plus are the new benchmarks for mobile photography. They pack refreshed sensors, a new image signal processor and a novel Portrait Lighting mode on the 8 Plus variant. This means there’s a bit of new stuff here, but there’s also a lot of what we’ve seen before when it comes to megapixels, apertures and shooting modes. But how do the phones stack up in the real world, and are they worth upgrading to from older models? Both phones have a stacked 12-megapixel Sony sensor paired with an f/1.8 aperture lens. With 1.2μm sized pixel, the iPhone 8 isn’t setting any records, but the on-board OIS should help with getting a good amount of light to the sensor. The iPhone 8 Plus benefits from a second camera offering 2x zoom. Despite also having 12MP, the second sensor and lens combination is inferior from a specs point of view, with 1μm pixels, no OIS and an aperture of f/2.8 hurting its on-paper low-light performance. The iPhone 8 Plus’ second camera will still bring significant benefits for a certain type of user. The Portrait mode introduced on the iPhone 7 Plus is making a return and a new Portrait Lighting feature, debuts on the iPhone 8 Plus in beta. Both these modes rely on the second lens to gain depth information. iPhones are well known for their excellent automatic mode. Point, shoot and the chances are you’ll get a great picture – at least by smartphone standards. The default shooting mode called ‘Photo’ adopts a simple enough UI that supports both tap-to-focus and tap-to-expose. The iPhone 8s can also shoot square photos and panoramas, as well as 'Slo-mo’ and ‘Time-lapse’ video. In addition to standard video it can also shoot 4K resolution at 60fps – class-leading for smartphones and achievable thanks to the power of Apple’s A11 Bionic chipset. If you want to take advantage of manual controls, you’re out of luck with the out-of-the-box shooting modes, although you have plenty of options in the App Store. The iPhone 8 also supports Raw capture when using third-party apps, which works well with the mobile version of Adobe Lightroom. Outdoor, daytime conditions make life easy for a camera, so it’s unsurprising that well-lit iPhone 8 and 8 Plus shots look nothing short of stunning. The Auto HDR option works well, capturing a good amount of tonal variance across a range of conditions. Colour balance is very pleasing, with good amounts of saturation and contrast on the whole. 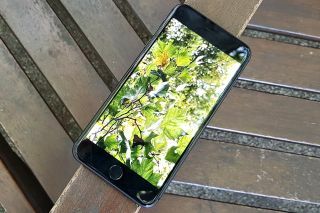 While detail is good and a natural amount of sharpening is applied as standard, the iPhone 8 doesn’t offer class-leading sharpness, so cropping into pictures won’t give you the flexibility it will on competing devices, such as the Samsung Galaxy Note 8. The iPhone 8 camera and iPhone 8 Plus primary camera are identical. Ignoring the second lens of the Plus for a second, both phones prioritise exposure for faces as a rule. If the camera needs to blow out a part of the scene in order to do so, so be it. That isn’t to say dynamic range is bad, it’s just worth remembering when shooting faces. If you like drama and a more even shot in general, you’ll want a finger at the ready to drag down the exposure slider. Low-light portraits look better than they did on the iPhone 7 on the whole, again leaning towards higher exposures, trading off some ambience for more face detail. This might be exactly what you’re after though, in which case, the improvements over the 7 are marked. As for ‘Portrait’ mode and ‘Portrait Lighting’, this is a great addition on the 8 Plus that adds a lot of versatility, on the proviso you can stomach the idea of fake bokeh. Utilising the 2x zoom camera, it gives you a roughly 56mm-equivalent focal length, combining the information from both sensors to create a depth map. This means that using software, the 8 Plus can both blur out the background and apply exposure effects to the foreground. The feature is definitely improved by comparison to the iPhone 7, delivering cleaner lines, especially in low light. To the untrained eye and for a casual social media snap it’s a very welcome addition, though it's still hit and miss, feeling like a beta around 50% of the time. If you love getting close to your subject, you will love the iPhone 8. It gets in closer than almost any other smartphone around, with the closest focal distance being roughly 6cm. With that wide-open main lens, it blurs out the background beautifully and foreground detail is nice and sharp. One caveat: exposure is aggressively weighted towards the foreground object, meaning it can blow out backgrounds by default. As for focus speed, it isn’t fast, but it is generally accurate. Smartphones like the LG V30, Samsung Galaxy Note 8 and Sony Experia XZ1, for example, employ more forms of autofocus, which allows them to home in on subjects in less time. The iPhone 7 was a solid performer in low light, with unashamed, totally reasonable amounts of grain in order to retain tapered exposure and realistic images. While many photographers appreciated this lack of overexposing and over-processing, others felt they were being short-changed on the exposure front. The iPhone 8 and 8 Plus seem to be responding to the latter demographic by upping the exposure across scenarios, most notably, low light. The results pull much more detail from scenes, though this can make shots feel a touch more artificial as a result. Low-light shots, therefore, while looking good, won’t be for everyone. That said, if you get comfortable with the very convenient exposure slider, you’ll see clear improvements over the iPhone 7 – and if you want to take things to the next level, you can shoot in Raw using a third-party app. Should I upgrade to the iPhone 8 or 8 Plus? Once again, Apple has loaded up its latest line of smartphones with excellent cameras. If you’re all about traditional photography and aren’t fussed on the Portrait Mode, the two iPhones are as good as each other. For anyone who has an iPhone 6 or earlier model, the iPhone 8 will be a revelation, and the 8 Plus, a lot of fun thanks to its Portrait and Portrait Lighting modes. Specifically, any iPhone owners who have felt that their phones underexpose by default should look into picking up an iPhone 8 or 8 Plus. If you have an iPhone 7 or 7 Plus however, it’s a much closer call, and one that probably won’t justify an upgrade just yet. If this is you, we would recommend hanging tight until the iPhone X launches in November with its f/2.4 second lens, 18:9 aspect-ratio screen and Face ID front camera. Check back to DCW then, when we’ll be able to refresh this piece and advise your camera upgrade after testing out Apple’s 2017 flagship.